Last Thursday night, we were invited to celebrate with the LJC Group's 35th year in the restaurant industry. 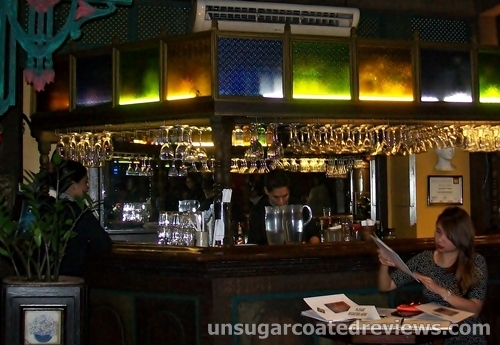 The event was held at the group's flagship restaurant Cafe Adriatico in Malate, Manila. 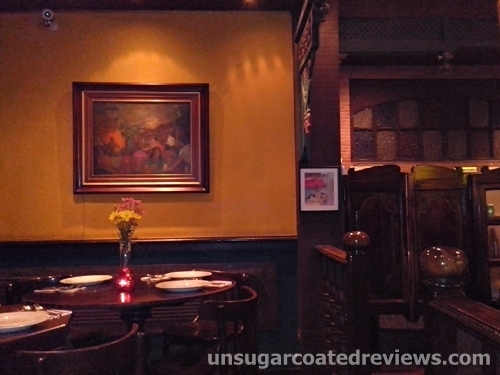 The restaurant has become a landmark location in Malate and now has branches in Gateway Mall and SM Mall of Asia. 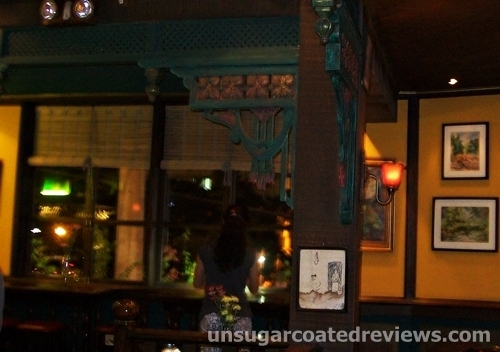 It serves a full menu of Filipino, Spanish, and Mediterranean inspired dishes. 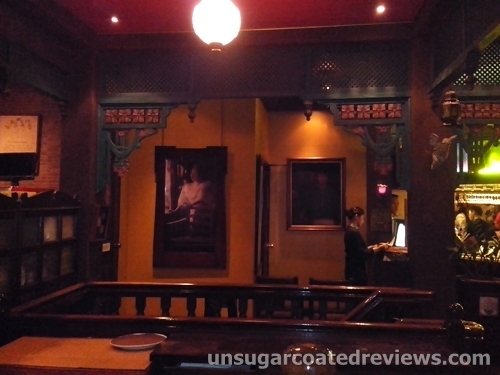 The restaurant's interiors are charming, with tasteful decors and an earthy, muted color scheme. Old Manila charm. 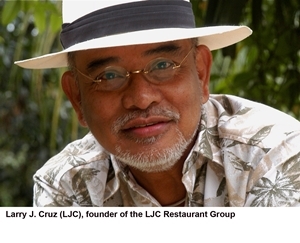 The "LJC" in "LJC Restaurant Group" stands for Larry J. Cruz, a journalist-turned-restaurateur who opened Cafe Adriatico in 1979. 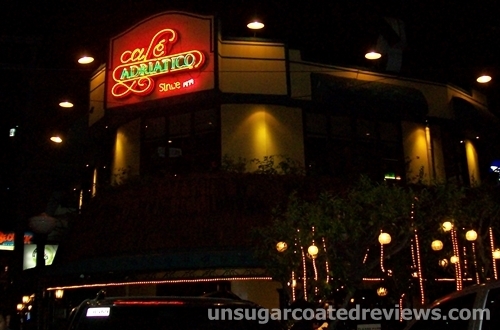 Aside from Cafe Adriatico, the LJC Group includes Cafe Havana (a Cuban bar in Greenbelt 3 where guests can enjoy tapas, hearty meals, mojito, and live Latin music), Bistro Remedios (for regional cooking in a bistro setting, located at the Remedios Circle in Malate), Larry’s Cafe and Bar (continental dishes and a wide range of wines and spirits, located at Serendra), Abe (Capampangan cuisine, with branches at Serendra, Trinoma, SM Mall of Asia, Alabang Town Center, and SM Megamall), Fely J’s Kitchen (Asian and home cooking at the 2nd level of Greenbelt 5), Lorenzo’s Way (featuring dishes that LJC himself conceptualized and his personal preferences such as baklava, paellas and tapas, located at the Bonifacio High Street and also at Greenbelt 5), and Abe’s Farm, (restaurant, resort, accommodations, spa and museum located at the foothills of Mt. Arayat in Pampanga). 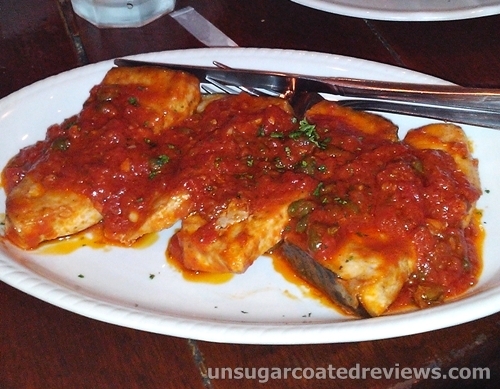 We got to try several of Cafe Adriatico's dishes. For starter, we had Gambas al Ajillo (shrimps in garlic -- Catalan style). 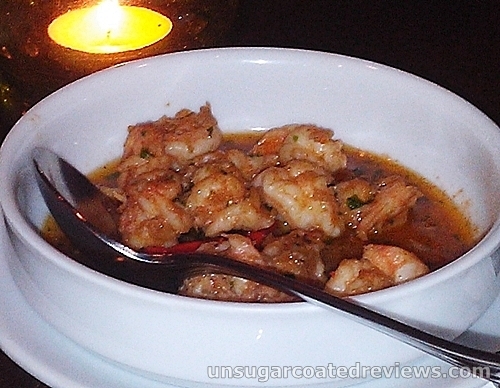 I'm partial towards spicy gambas but Cafe Adriatico's version was also good even if its heat was only mild. Then we had hummus (eastern Mediterranean blend of chickpeas, garlic, and spices) with pita bread. I was not a big fan of hummus before (the ones I had had were bland and not memorable) but I really enjoyed Cafe Adriatico's version because it was a bit spicier and not as oily. 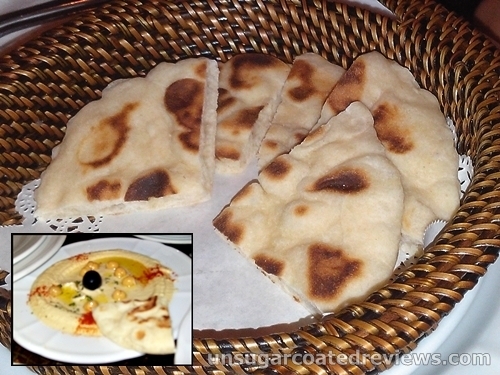 The pita bread tasted fresh and went really well with the hummus. For soup, we had cream of two mushrooms which had finely chopped button and shiitake mushrooms. 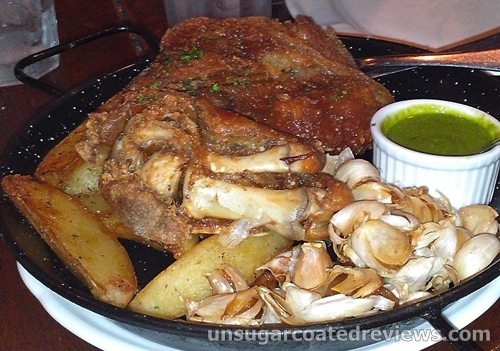 Then came Cafe Adriatico's new signature dish for their 35th year: Garlic Pork Leg Españole (Spanish style pork leg with fried whole garlic cloves and potatoes in olive oil, served with a tangy herb sauce). 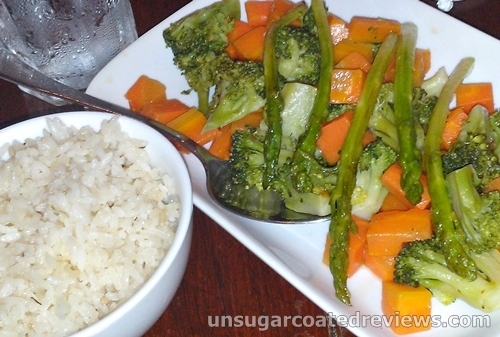 At first I was apprehensive because it looked crispy and I had had problems with some crispy food since I began wearing braces. 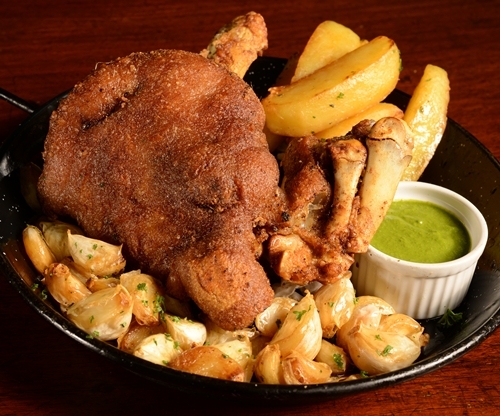 Thankfully, the Garlic Pork Leg Espanole had a crispy exterior but the meat was tender. When it was served, they advised us to eat it with the garlic cloves. 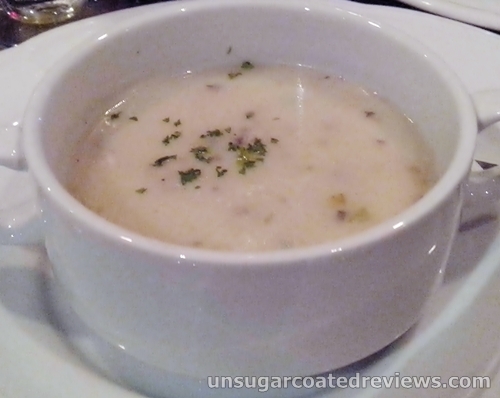 The garlic cloves were quite soft and tasty, not the usual strong flavor and without the aftertaste. The green sauce looked like pesto but it was not. It was made with parsley and had a milder taste, just enough to complement but not overpower the taste of the meat. 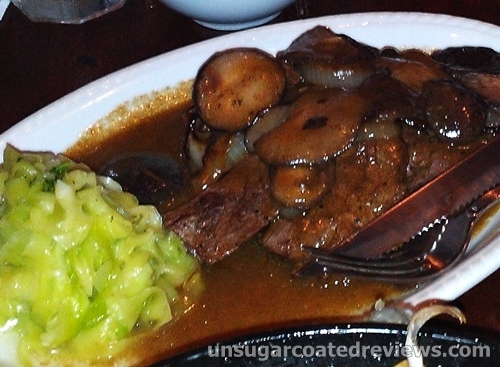 The U.S. Tenderloin Steak Solana was pan-fried and topped with seared onions and shiitake mushrooms. It was served with buttered zucchini slices, mashed potatoes (not in picture), and a mild peppercorn sauce. The zucchini was shaved, very thin, and thus looked like flat noodles. There was also Blue Marlin Provencale (topped with tomato and caper sauce) and Pilaf rice (French style buttered rice), as well as buttered vegetables (broccoli, asparagus, and carrots). 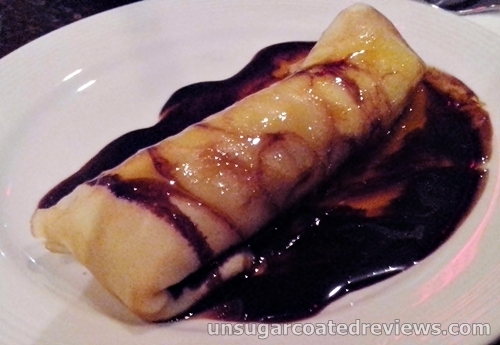 For dessert, we had mango crepe, with flambeed fresh mango and topped with chocolate syrup. We were also given a decadent chocolate cake. 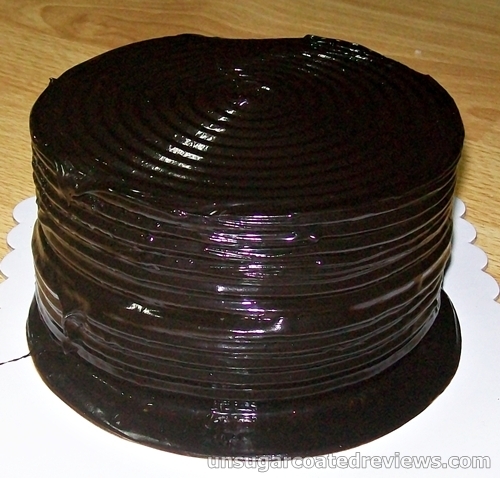 It was moist and dense and the rich chocolate frosting was sweet but not too sweet as to be cloying. Wow! I haven't been back to Malate since ages ago. The food here looks great ah! I will surely try it out if and when I go there.